In honor of Thanksgiving, I share this secret family recipe. Like most families, we have recipes and cooking styles that have been handed down for generations. This particular recipe is one of our most treasured. While seemingly simple, it’s actually one of the most difficult to execute properly. Younger members of our family are supervised for years by our veteran cooks before they are allowed to take responsibility for bringing this dish to a family gathering. I’ll never forget the time I was practicing the preparation of this dish with my grandmother and I repeatedly messed up the proportions, ever so slightly. Each time, we threw out everything we had worked so hard to prepare and started from scratch. At the time, I was embarrassed and frustrated and I may have even cried, but today I am grateful for her insistence on perfection. The hours we spent developing the nuance of this presentation have paid off. I think if you practice enough, you too will notice the difference. As with any recipe, the fewer the number of ingredients, the more important their quality is. You can see this recipe benefits from better ingredients. In a clean medium candy dish, place a layer of peanuts over the bottom of the dish. There should be more than a single layer of peanuts, but not quite a full double layer. Next, place a layer of red hots over the peanuts. There should be slightly less than a full layer, as the red hots have a stronger flavor than the peanuts and will have a tendency to overpower the dish if not managed properly. 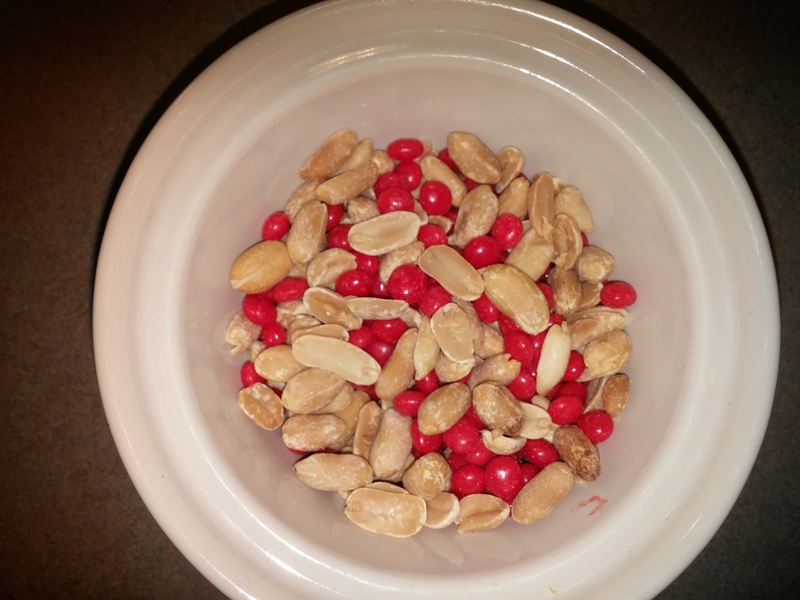 Continue layering peanuts and red hots accordingly until the dish is full. Keep a careful watch on the proportion of your ingredients and adjust as necessary. I aim for 5/8 or 9/16 peanuts and 3/8 or 7/16 red hots, depending on whether I’m in the mood for more or less red hot flavor. This should only make a difference in adding one or two red hots in each layer, so you shouldn’t have to adjust much depending on which you prefer. Simpletons and hacks will simply dump half and half of any kind of peanut and cinnamon flavored candy into a bowl and mix it up a little with their fingers or, if you’re lucky, a spoon. These people should be flogged in a public square. They disrespect the traditions of my forefathers and should be punished accordingly. No, this delicate recipe should be prepared with love and careful attention. I would encourage you to practice often before sharing this dish with others in public. It seems so simple, yet it will be immediately obvious if you’re preparation is not up to par. Don’t embarrass yourself. Take the time to practice and get it right. You’ll be glad you did! I first saw Peelander-Z at Riot Fest Chicago in 2013. My friend had heard about them and thought it sounded like they would be fun. Well, that’s a huge understatement. If you can’t have fun at a Peelander-Z show, you’re probably the kind of person who would rather stay home and sort socks. In fact, we loved their Riot Fest set so much we skipped the headliner and caught their after-show at a small club later that night. I knew I was in for a treat on this cold November night. So for the uninitiated, let’s back up a bit. 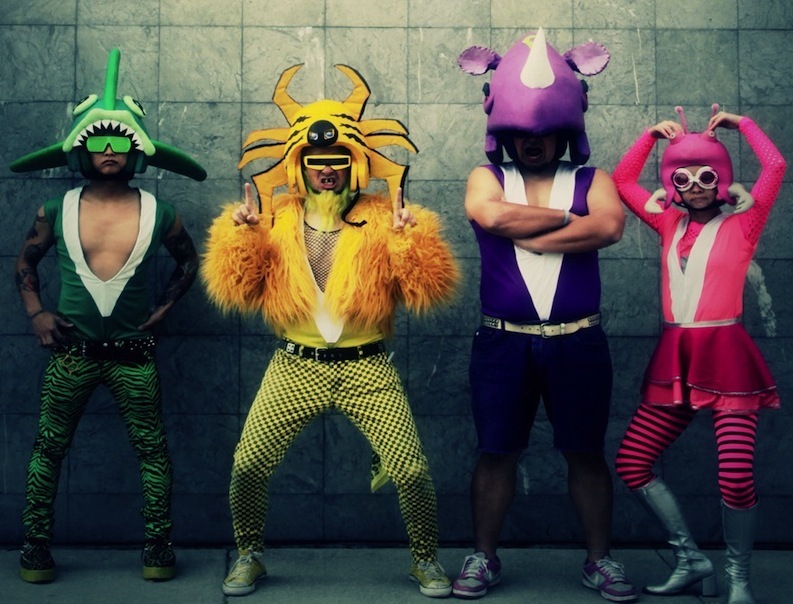 What do we know about Peelander-Z, besides the fact that they are awesome? According to their website, they come from the planet Peelander. The members present Friday night were Peelander Yellow, Peelander Pink and Peelander Green. I’ve seen Peelander Purple before but he wasn’t around Friday night. The band is heavy on audience participation, even though they apparently don’t speak English too well (they are from a different planet, after all). This means they rely heavily on sheer energy, limited lyrics and gestures to communicate what they want the audience to do next. The show Friday night was a lot of fun. It was one of the first really cold nights, so the crowd wasn’t too large but the people who were in attendance were very enthusiastic. That said, it can be harder to coordinate a smaller crowd than a larger one, especially when many were seeing Peelander-Z for the first time. This meant Peelander Yellow took more time trying to communicate to people what he wanted them to do but he ultimately got his point across. They sure seemed like they were working hard, whereas the previous shows I saw they were able to relax more and enjoy a crowd that knew where Peelander-Z was taking them. If you ever get the chance to see Peelander-Z, don’t miss them. It might look a bit insane (it is) but if you just enjoy the mayhem it will possibly be the most fun you will ever have at a show. What I think of the midterm election results. Why did the Republicans win so completely? They understand that they have to rev up the base for every election, but that each voter matters in low-turnout elections. They do a great job of getting people fired up to vote. After all, the future of America is at stake! For Democrats, it’s more an attitude of ‘Things will be ok either way but help us enact policies.’ Not the same level of urgency, for sure. Gerrymandering means that there are really not that many seats in contention for either party at the House level. For the Senate, it’s easier to get a single candidate elected, especially in an otherwise non-eventful voting year. 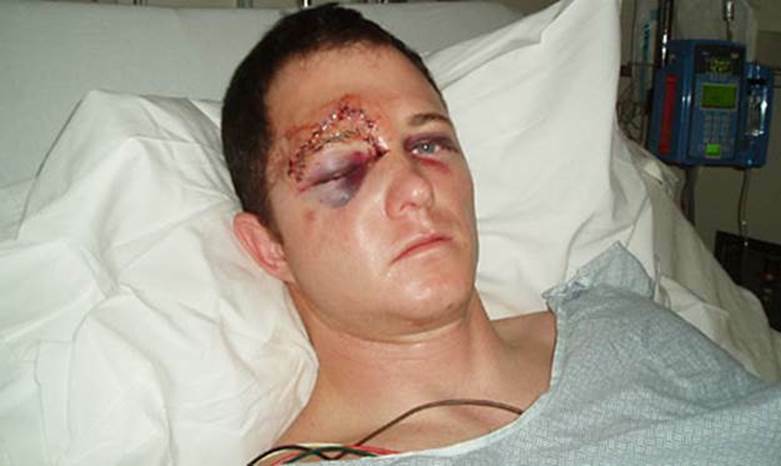 If you can convince the base to come out in any election, you are going to fare well. This is especially true in years when there is a low turnout. Why did the Democrats lose so badly? KLEPPER: Last night, at approximately 11:27 EST, the Republicans gained control of the U.S. Senate and the results were almost immediate. The economy, now growing at a robust 3.5 percent. Gas this morning, under three bucks a gallon. Look, stock market at record levels. Deficits cut in half. Ten million more Americans have health insurance. And unemployment sub six percent for the first time since we elected “chairman” Obama. KLEPPER: Even Ebola… look Jon… which was on the verge of destroying the country under Obama’s feckless leadership has suddenly become a problem for like… one guy. It’s morning in America Jon! STEWART: Jordan, that is an incredibly impressive list that you ticked off of things that happened under Obama and the Democratic Senate. KLEPPER: Oh please Jon, if Democrats had accomplished all of that, they would have been out there bragging about it for months. It would have been the central message of their campaign instead of their actual message, which was like, I’m quoting this here, “We’re sorry, don’t be mad! We don’t like Obama either and we like guns too! Amen. What does this mean for the last two years of Obama’s presidency? Probably not much, honestly. I mean, are Republicans going to be even more obstructionist than they have been? I don’t see how. So it’ll probably be more of the same. Republicans may have to take some responsibility for governing now. However, I can’t see them passing anything that will actually include compromise. My guess is they will pass a lot of legislation with Republican stances and make Obama veto them or they will pass legislation that appears reasonable on the surface but contains poison pills that are completely unacceptable. Either way, they will then claim they are passing legislation and that Obama is now the real obstructionist. Perhaps there will be some areas of true compromise. I hope that this comes to fruition. Like most Americans, I value compromise and wish our elected representatives would engage in it more often. Republicans are not evil, and their ideas are worthwhile, even if I often disagree with them. I actually think the biggest problem is that Republicans regularly promote the idea that Obama and Democrats are evil and seek to destroy the country. That’s simply not true either and makes real dialogue impossible. Does this mean the country has rejected Democratic policy ideas and endorsed Republican proposals? At the end of the day, I think Congress is so gridlocked there just really isn’t a whole lot of room for anything to really get done, no matter what the election results are. The sad thing is, we have real problems around immigration, public health, infrastructure, climate change, and more that desperately call out for our elected officials to work together. I don’t see that happening any time soon, but a boy can dream, right?